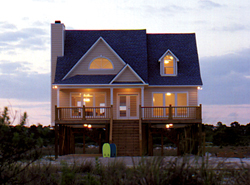 Cottage house plans tend to be smaller in size with one or one and a half stories. Most cabins and cottages are characterized by an overall cozy feeling that make them perfect for vacation homes. In the Middle Ages, they housed agricultural workers and their families, thus they were smaller peasant dwellings. In North America, cabins or cottages are used for weekend or summer getaways by city dwellers. These home designs generally are located near lakes or the ocean, or in wilderness areas near exceptional fishing and hiking. The Maxton Tudor Cottage Home has 1 bedroom and 1 full bath. 544 Sq. Ft., Width 22'-0", Depth 32'-0"
The Willowdale Bungalow Home has 1 bedroom and 1 full bath. 960 Sq. Ft., Width 30'-0", Depth 48'-0"
The Shaker Lane Small Home has 1 bedroom and 1 full bath. The Copper Creek Rustic Cabin has 1 bedroom and 1 full bath. 950 Sq. Ft., Width 32'-0", Depth 31'-0"
Our collection of Cabin and Cottage style home plans encompasses the cozy feel associated with small house plans. Our blueprints have detailed floor plans that allow the buyer to envision living in their new home. With a huge selection, we are sure that you will find the perfect plant o suit your needs. Browse our collection here at House Plans and More and find Cottage and Cabin house plans perfect for you.